Polymer clay is a great way to keep your hands busy, and it is possible to come up with the most incredible designs, patterns and ideas! Follow our easy step by step instructions and learn how to make a beautiful cane using pie techniques and polymer clay. Polymer clay is PVC based product with liquid plasticizers which keep the clay manageable and soft until baking, which can be completed in a house-hold oven. 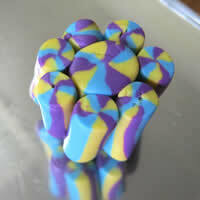 There are so many interesting patterns and ideas one can come up with using polymer clay. Check your hands in between working with each colour as you do not want to transfer pigment from one colour, from your hands to the next. 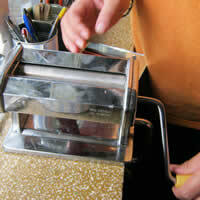 Use the damp cloth to clean you hands of any pigment residue. Open your polymer clay packets and estimate how much you will need. Break this section off and seal the rest of the packet, as if left open the polymer clay will slowly harden and be harder to work with next time. 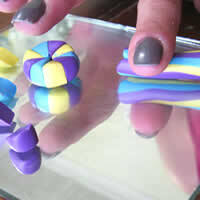 You need to break off an equal amount of each colour of polymer clay. 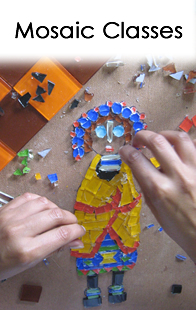 Begin to play with the clay, working it so that it becomes softer and more manageable. You can use your pasta maker to help soften the clay. Make a roll and send this through the pasta machine several times until it is pliable. 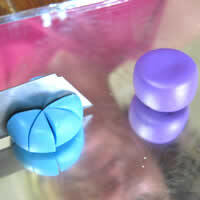 Shape the polymer clay so that you have three disks, one of each colour, each about 2cm wide and 1.5cm high. 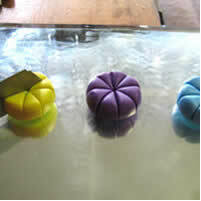 Place your three disks of clay onto the working surface, this is the sheet of glass or mirror you will work on. Ensure that the surface is clean. 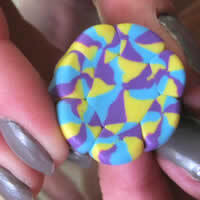 Using your full length of blade, cut each disk of polymer clay. You will cut these like a pie, into eight slices. With all disks cut into 8, you need to separate all the slices before re-building the pies using all the colours. 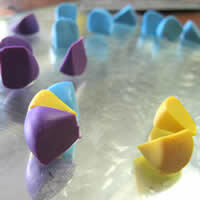 You will take one of each colour and set it next to the other, working your way around until the disk is whole again. 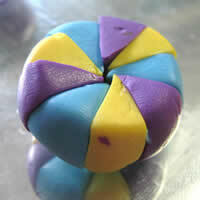 With one complete disk, you want to lightly compress the polymer clay pie together again, to form a more solid piece. 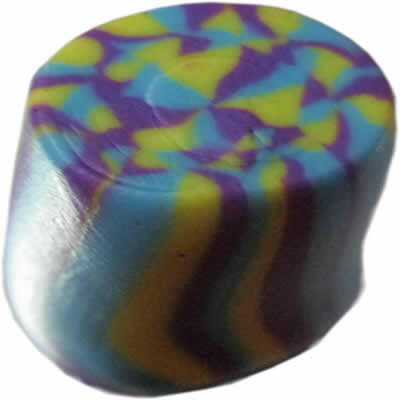 Now you can begin gently rolling this disk, slowly stretching it into a fat cane. 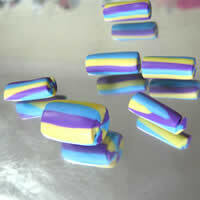 You will need to achieve a polymer clay cane which is about 5cm in length. Once you have this, use the full length of the Stanley knife blade to cut the ends off the cane, as these are usually not shaped well. You will do this by rolling the blade over the cane, back and forth (allowing the cane to roll with the blade) and applying pressure. 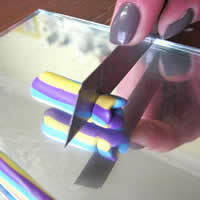 This method of cutting will ensure that the colours do not mix and the cane retains its shape. With a second disk, proceed as per Step 5, in compressing the colour and rolling out to form a polymer clay cane. This time, you can continue rolling the cane to form a much longer and thinner cane. Cut this cane as per Step 6. You will be left with thin pieces of cane and the thicker cane from Step 6. Pack the thinner cane lengths upright and around the thicker one, so that there are no gaps around the main, thicker cane. Now you want to work this piece, lightly compressing the colours together as per Step 5. 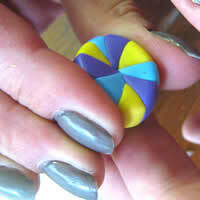 Proceed to roll this polymer clay shape out into a cane. Remember to work from the middle towards to the outer edges, using your fingers on the working surface. Once you have the desired width of the cane, you can go ahead and cut the length as per Step 6. 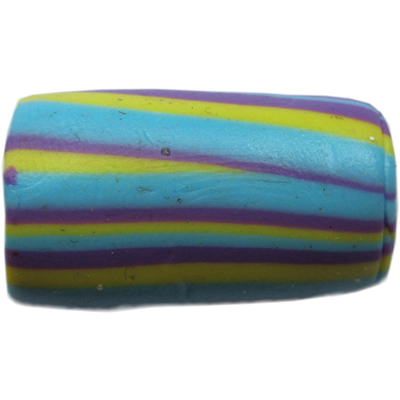 The ends of the cane lose their design completely, but they can still often make great beads as the colours mixing can leave very interesting designs and pattern in themselves and give a very organic feel. Done! 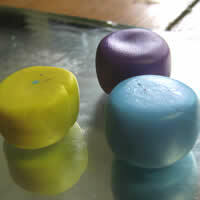 You now have three colour, polymer clay beads, made using polymer clay pie and cane techniques! Now you can slice the cane into your desired thickness. You now need to leave these overnight to air dry before placing in the oven for about 15min at 140 degrees Celsius. They will bake to a very hard, nearly indestructible bead. TIP: you can make your beading holes in each bead either before baking (when it is soft) or after baking.